Dura-pitch forks are light-weight but very strong polycarbonate, with wood handle. The deep basket design is ideal to get a better load, without fall-off on the sides. Many uses on the farm and around stables. Available in Large (30cm x 40cm) and Small (26cm x 30cm). 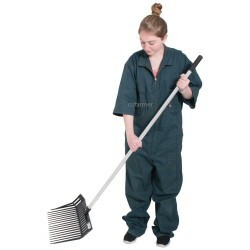 Great for removing droppings of any housed animals, stock at shows, stalled stock etc. Made of spac..